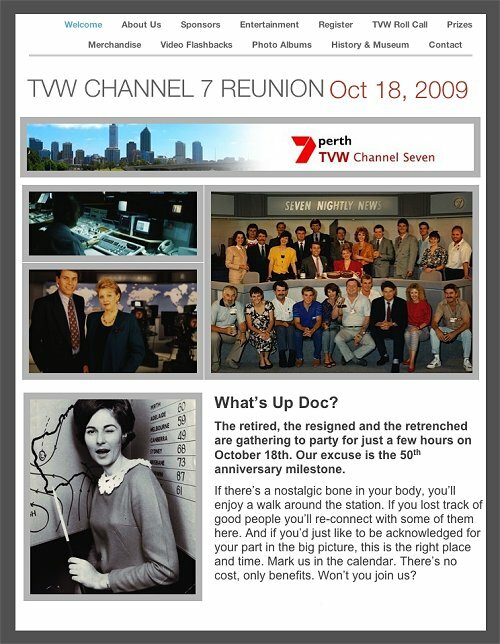 A huge gathering of veterans from the WA television industry is expected at a major 50 year reunion of TVW Channel Seven on October 18 this year. The celebration will be held at the same Channel Seven studios at Tuart Hill from which the State’s first telecasts emanated on October 16, 1959. Since those pioneering days, over 3000 people have worked for Seven and its allied companies and a good percentage of them are expected to show up for the reunion on Sunday, October 18. An organising committee has been working for some months to plan the event, which will, also, mark the foundation of the television industry in Western Australia. All former TVW Enterprises Limited staff who worked at the Tuart Hill site and who registers on the reunion website will be invited to attend. Former staff who wish to attend MUST register on this site to obtain a pass and name badge as no passes will be issued on the day at the gate. Guests will be entertained by a fellow television veteran Johnny Young and The Strangers Club 7 Teen band. Johnny was one of TVW7’s first teenage stars. He now fronts the group and hosts the Radio 6iX Big breakfast show. The Stargate Actors Academy and Perth opera singers, Justin and Katherine Friend, will also perform. The reunion starts at 2pm and there will be ongoing inspection tours of the studios, which have been vastly expanded since the then Governor, Sir Charles Gairdner, declared the station officially opened in 1959. Other prizes include an excursion for 50 people to the Swan Valley Wineries valued at $1500 from Roland Ott’s Nightcruiser Company (www.nightcruiser.com.au). “The 50 year mark is an opportunity for people to renew friendships, to collect and display memorabilia and compile a more detailed history of the industry,” Jocelyn Treasure, of the organising committee, said. Another major event running in tandem with the TVW7 anniversary will be the Australian Museum of Motion Picture Technology’s exhibition at the Fremantle Museum (www.ammpt.asn.au). People with material of historical significance should contact Darryl Binning of the AMMPT on (08) 9310 3377 and those who have unusual or amusing promotional items can offer them to the committee via the reunion website. The TVW 50th Reunion Committee comprises Jocelyn Treasure, Bret Treasure, John Young, Keith MacKenzie and Keith Bales as honorary secretary with Daryl Binning of AMMPT and Ken McKay as observers. “Johnny Young said, “The committee would like to thank TVW for hosting the event and we reiterate that registration and commemorative merchandise including polo shirts, T-shirts, sports bag, cap, mug and a Limited Edition wine offer can be accessed on this web site. My best wishes to all involved with the Reunion. My first television performance was singing “Wooden Heart” on Children’s Channel 7. Singing on In Perth Tonight with Gary Carvolth followed and I then hosted Club 17 when high school exams permitted. The Swinging 60’S. Brian Treasure was a great mentor to me and TVW’s training, prepared me for hosting five national TV series including The Happening, Starsearch and My Generation. Winning a Logie Award, King of Pop award for television,playing the Rum Tum Tugger in the stage musical “CATS”, winning the Greek International Song Festival and re-uniting with Rolf Harris on his BBC TV series ……. all started with TVW7! Thank you.